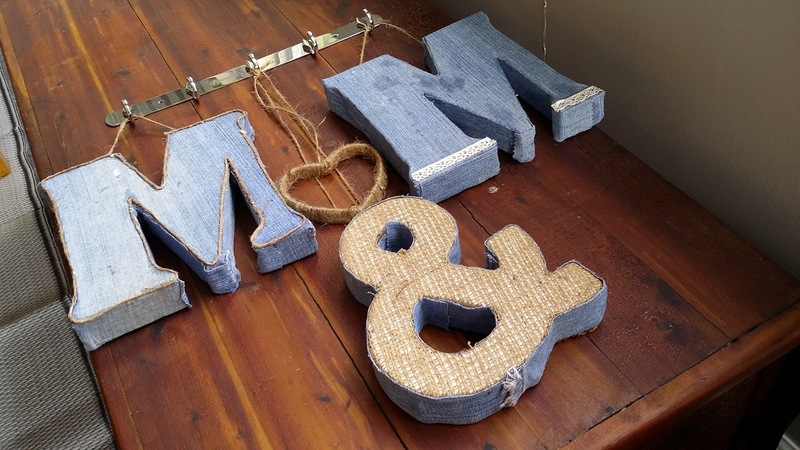 If you've been around for a while, you know I love words, letters and initials. If you haven't been around for a while, WELCOME! Soooo. . . . . . . 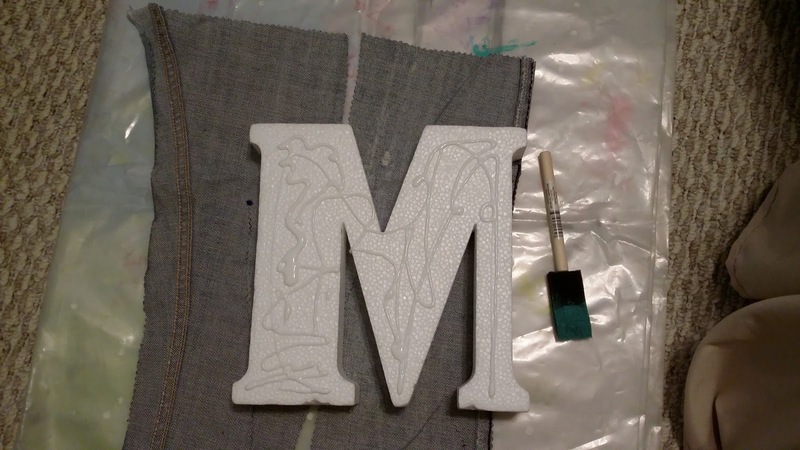 I bought these styrofoam initials a long time ago with a plan in mind to cover them and put them somewhere in our house. I chose M & M, because they are my & my hubby's initials. (We even had m&m favors at our wedding. Corny, I know!) When they poured a new sidewalk segment at our old house, my hubby scratched an M & M into it. I'm sure it's still there today. 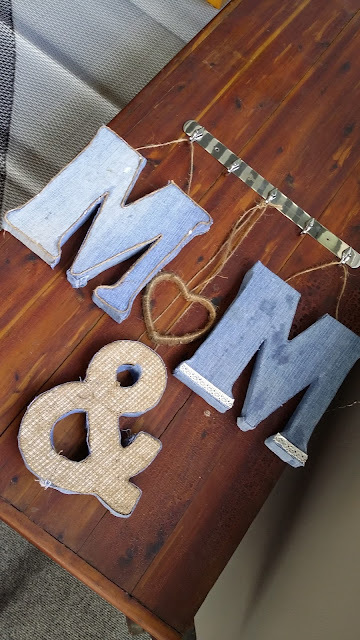 So, when I went to buy any kind of initials, I knew it would be "M"s.
Since I'm going to be working on decorating our sunroom this year, I decided I'd use the initials in the sunroom. (Finally) Finally what? Finally decorating the sunroom and FINALLY using those letters. 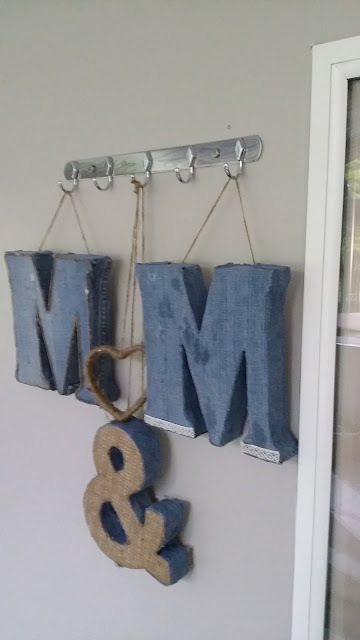 I think the sunroom has been built for almost 4 years now and who knows how long those letters have been hidden in my craft room. The sunroom, it's just been kind of "there." Know what I mean? It becomes a storage room over the Winter most years, but this is the sunroom's year. This is the year it gets to become "more", instead of just "there." I was recently given the opportunity to try out something from the Cave Tools line. All of their items look really cool for Summer. Most of their items are great helpers for the Summer barbecue season. 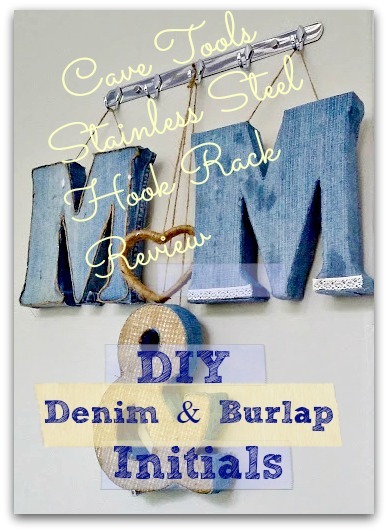 I decided that I'd like to try the Stainless Steel Hook rack. Once I got the rack, I decided that instead of using it for kitchen tools, it would make a cute display rack of some sort. That's when that long-forgotten initial project popped into my head. When I began to think about covering the letters, I had no idea what I wanted to cover them in. 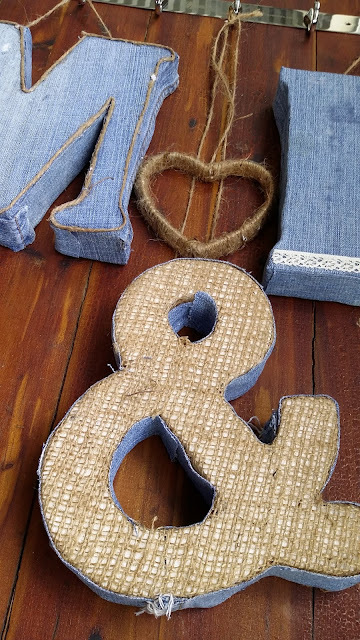 I was thinking burlap. Having worked with styrofoam before though, I didn't know if it would work. Styrofoam isn't the easiest medium to work with! If you use hot glue, the styrofoam melts and regular tacky glue doesn't always stick to it. I'll get to how I created these after the Cave Tools Hook Rack Review. The hook rack is made of stainless steel which is meant to be durable for both indoor and outdoor use. The rack comes with it's own set of tools, including a double-ended screwdriver. We didn't use all of the pieces of the tool kit because the wall we were screwing it into was actually plywood instead of drywall on studs. My hubby is not a big fan of the those little green things (wall anchors) anyway. He never uses the included anchors and instead uses higher quality ones that he already owns. Being a carpenter, he has his own way of doing things. We did use the the little stainless screw covers though so that the rack has a "finished" look. Please note: You will still need a drill to create holes to put your anchors in. I love the versatility of the rack. 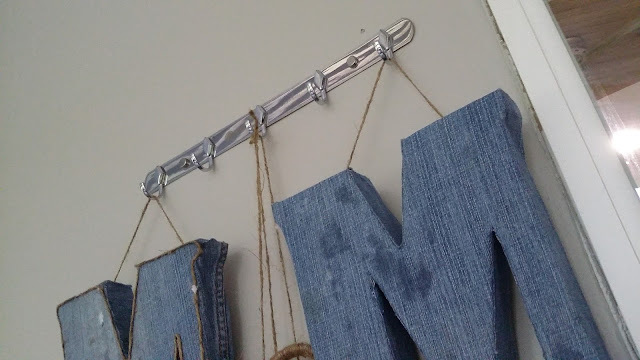 You can use it anywhere to hang all kinds of stuff. I tried the intended BBQ tools on it. I also tried some coats on it. 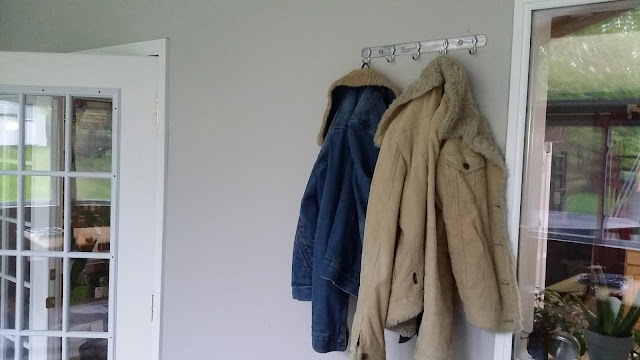 It would probably hold up to 3 coats and it would likely hold 5 smaller, lighter weight jackets since they would hang thinner. 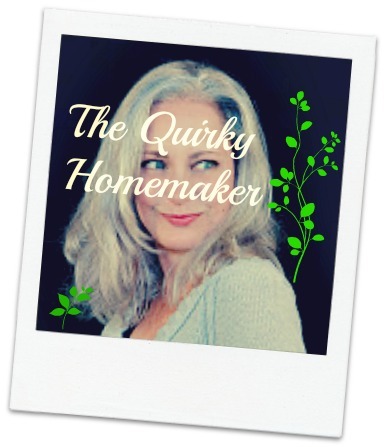 Other people have used it to hang coffee mugs in their kitchen or hair tools in a hair salon. The rack is 15 inches long with 5 hooks that are 3 inches apart. 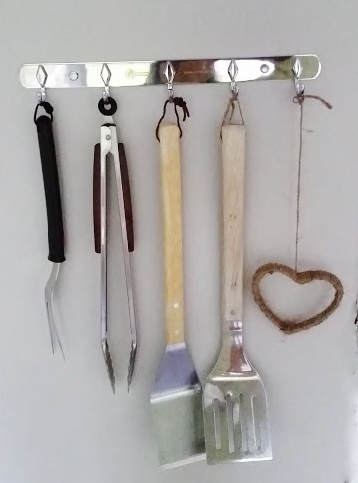 Since it's original use was meant to be a BBQ tool rack, the hooks are fairly close together, so it would be better at hanging smaller or narrower things. It took my hubby less than 2 minutes to hang this. I did see from the reviews that some people attached it directly to their grill using pop rivets. 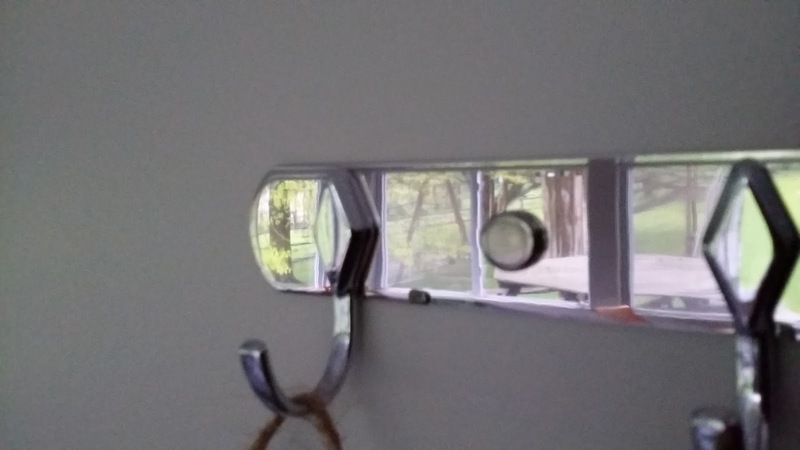 My hubby just used a screw gun and the included screws and attached it directly to the wall in our sunroom without anchors since it was into plywood. For my intents and purposes for this rack it worked out really well. 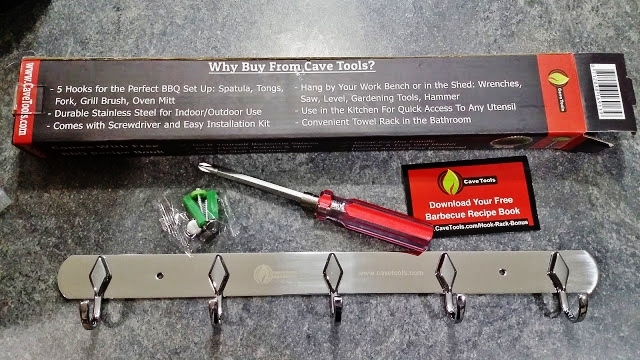 When you order through Amazon or the Cave Tools website they send you an email with directions for installation and a recipe book. 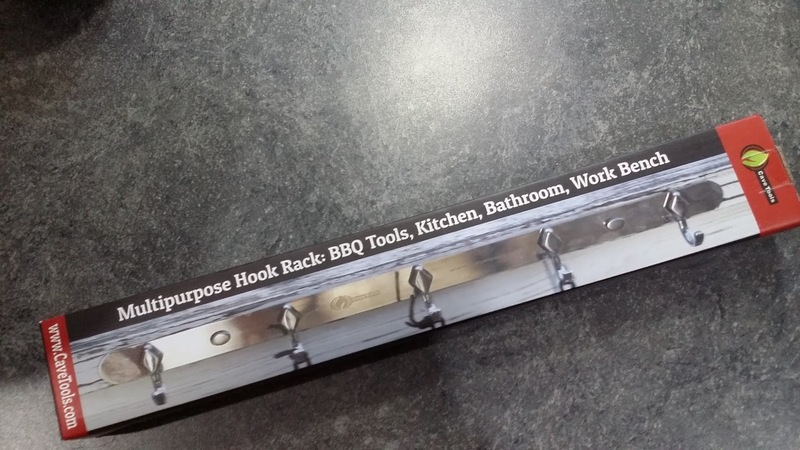 The hook rack is selling for $17.99 on Amazon. If you have Amazon Prime, the shipping is free. 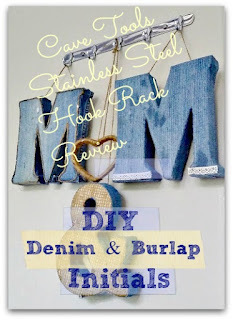 NOW for HOW I made those DENIM Covered Initials to hang on my Handy-Dandy Stainless Steel Rack! 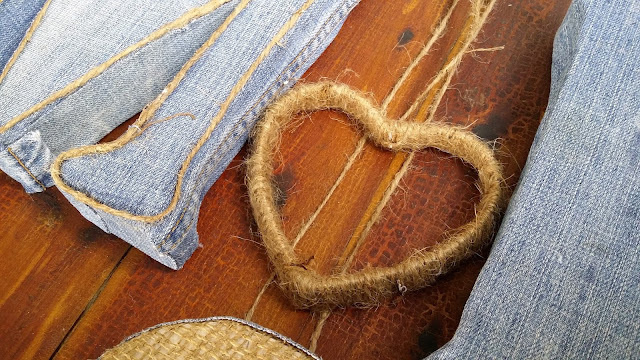 I used a pair of my hubby's old work jeans for this project. I love that they're all stained and beat up. They represent all of the hard work that he's put into supporting our family and his strong work ethic. Originally, his was the only one that was supposed to be "stained." 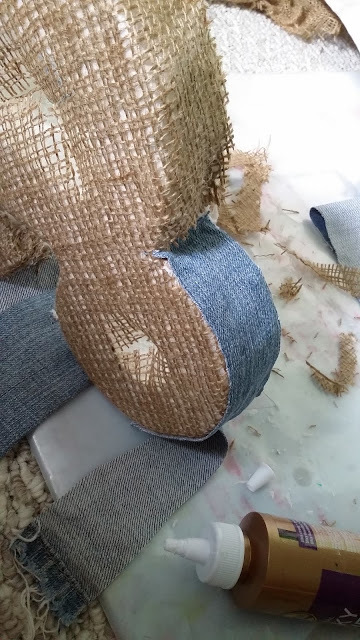 Mine was supposed to be just denim & pretty! Ha! 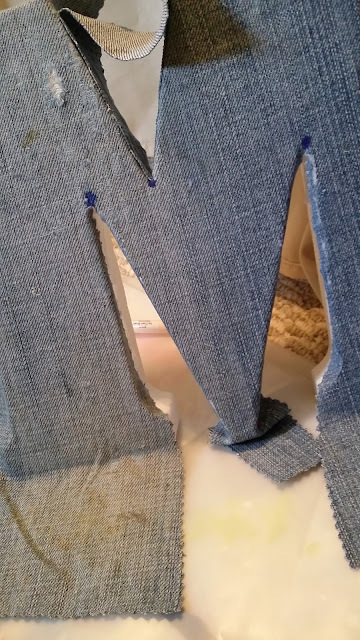 Once I glued the fabric on mine though, the glue stained the fabric. 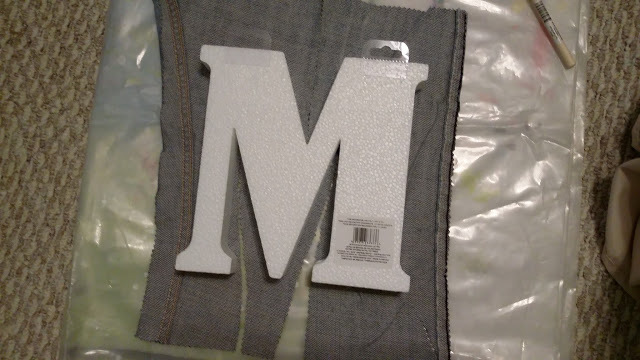 To begin this project, I cut a square out of his jeans that would be big enough to cover the front and some of the edges of the letters. Because my marker bled through, I had to figure out another way to decorate it to cover the marker spots. That's when I came up with the jute cord edge. I actually love the way it turned out. 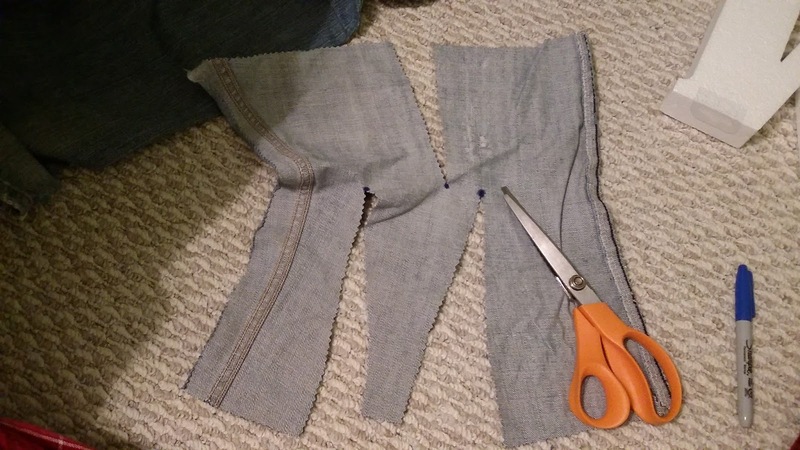 and placed it on top of the wrong side of the fabric. 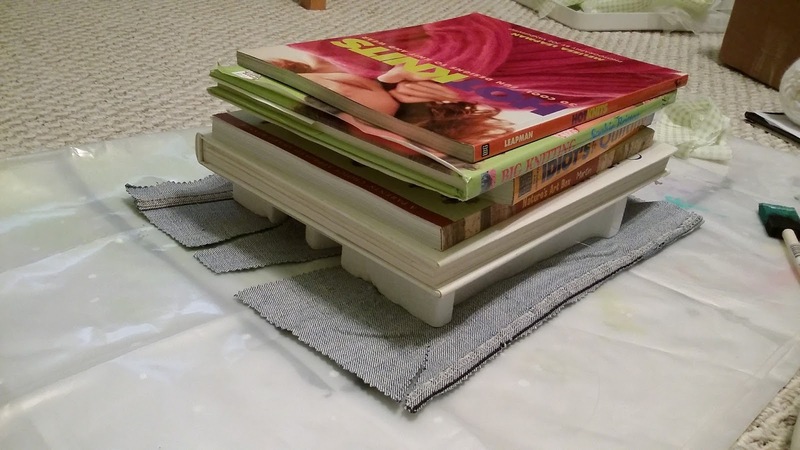 Then I placed a stack of books on top of it to weight it down while it dried. 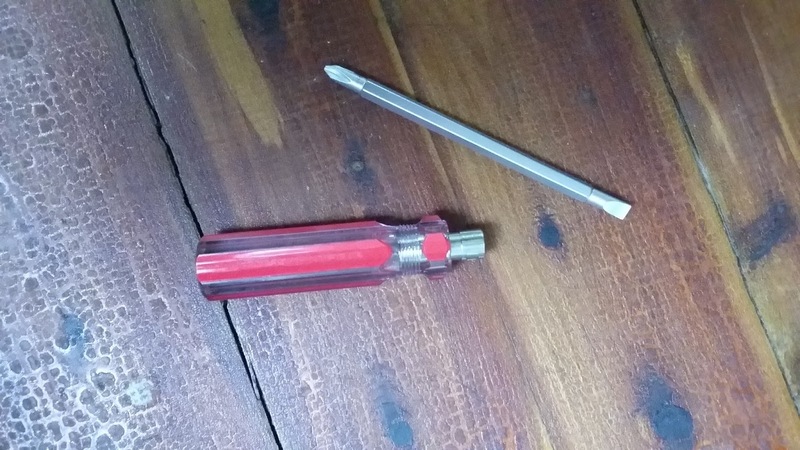 As long as you don't put on too much glue, this step should be fine. I worked on a plastic surface. At some point, you need to flip it and let it finish drying. I let them dry for a day before I moved onto the next step, which was gluing the sides down. 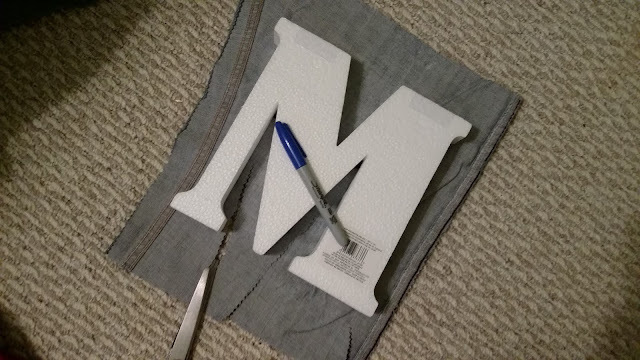 Once the sides were glued down, I cut strips the width of the letter to finish the sides and glued the strips on. Once the fronts and sides were covered, I attached jute cord to the back so that they would hang from my stainless steel hook rack. 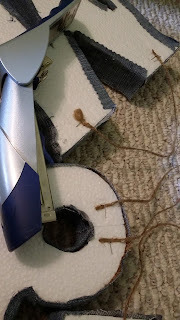 I was hoping that I would just be able to staple the cords onto the back. . . .. . . . but. . .. . . styrofoam. I stapled them just to keep them in place and then put a dab of tacky glue on top of the spot to glue them. I covered the "&" with burlap on the front and covered the sides and inside with a strip of denim. 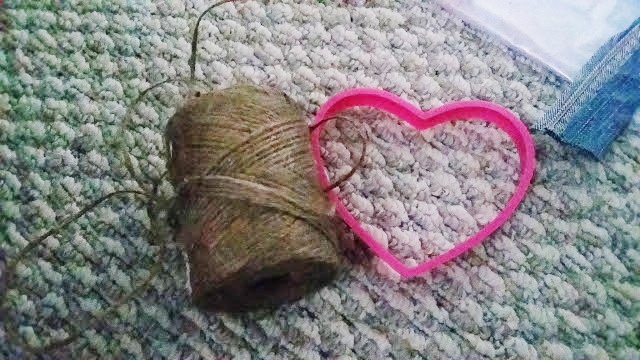 The little heart that I have hanging with it is a cookie cutter that I wrapped with jute cord. I just started it with a dab of hot glue and placed a dab of hot glue every now and then just for good measure. and how it looks hanging from my Cave Tools Stainless Steel Hook Rack. I think it will be cute hanging on our sunroom wall, especially once we get the rest of it decorated. This turned out so great! Love it! Pinned to share. Thanks for sharing with us this week at Brag About It! We're happy you found us! Thanks for sharing with us at #overthemoon link party. 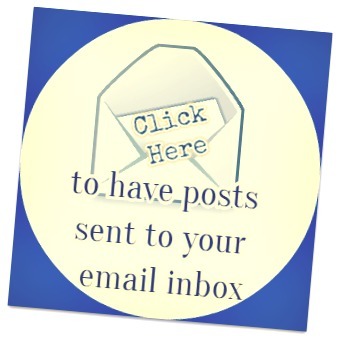 I've pinned and shared.